The best camping in Wisconsin. No better place to camp and chill than the land of lakes and ice cream. If there's one thing you can't avoid on a camping trip to Wisconsin, it's the water. 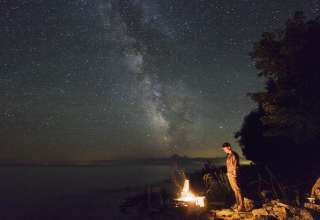 Thousands of lakes, streams and rivers mean it's no surprise that Wisconsin is a favorite camping destination of fishers, boaters, swimmers and white-water rafters. There's no shortage of spectacular scenery here, where a stay at Devils Lake offers stunning quartzite formations against clear blue water. 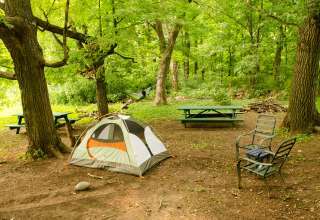 Or head just a little north for top-notch camping near Wisconsin Dells, the waterpark capital of the world. Sprinkled throughout the state are private lands, orchards and farms that welcome campers from far and wide, offering open meadows and cabins for camping, or a lesson on organic farming. 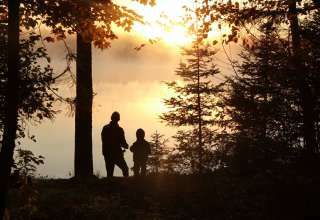 Wisconsin has an abundance of state parks, so head north to the lush forests and rivers of Chequamegon-Nicolet or down to the tranquil world of Lake Kegonsa. As long as there's swimming, boating or ice cream involved, you're doing Wisconsin camping right. The first hydroelectric plant ever built in the US was constructed at Fox River in 1882. 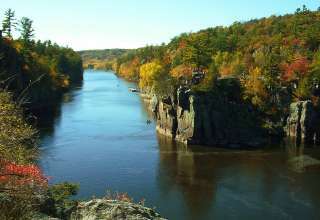 7,446 streams and rivers can be found in Wisconsin. Birders take note! Mercer, Wisconsin is the Loon Capital of the World. Wisconsin is America's dairy capital, producing more milk than any other state. Every year, Nordic skiers from around the world flock to Wisconsin for the American Birkebeiner, a 52 kilometer cross-country ski race.